It’s Columbus Day weekend, my favorite weekend of the year. 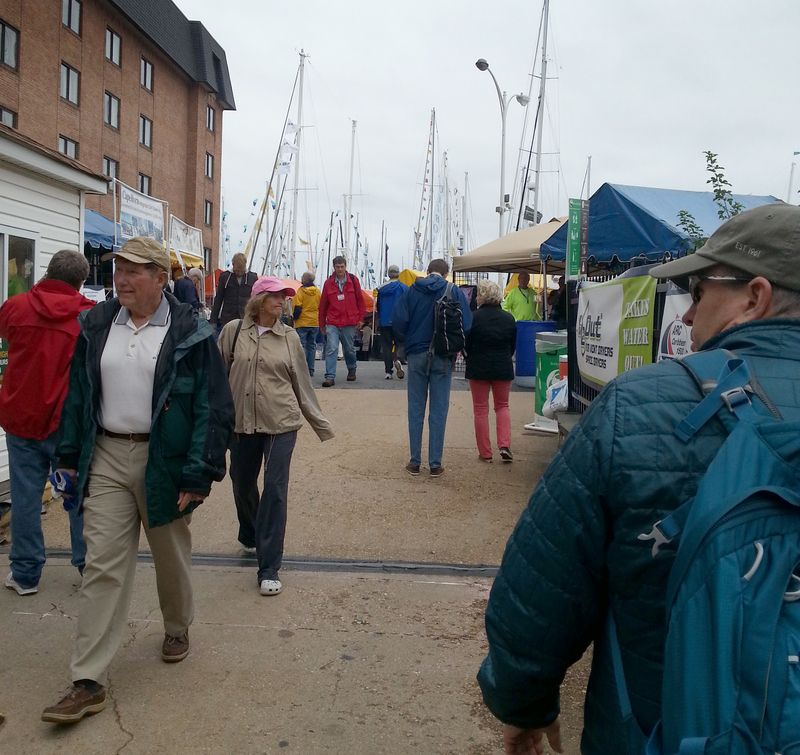 We’re headed down to the 44th Annual United States Sailboat Show in Annapolis. I’m on a mission to purchase a pressure cooker. 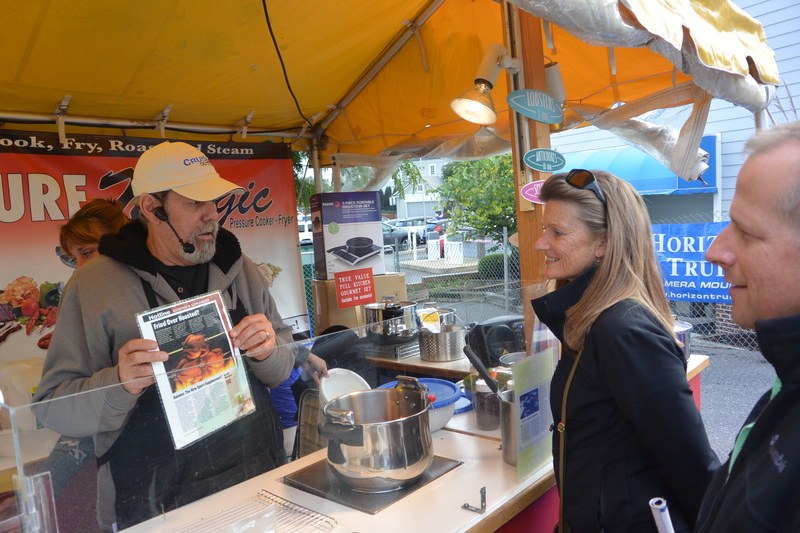 There is more than one booth selling pressure cookers, but only one booth that sells nothing BUT pressure cookers. With demos. 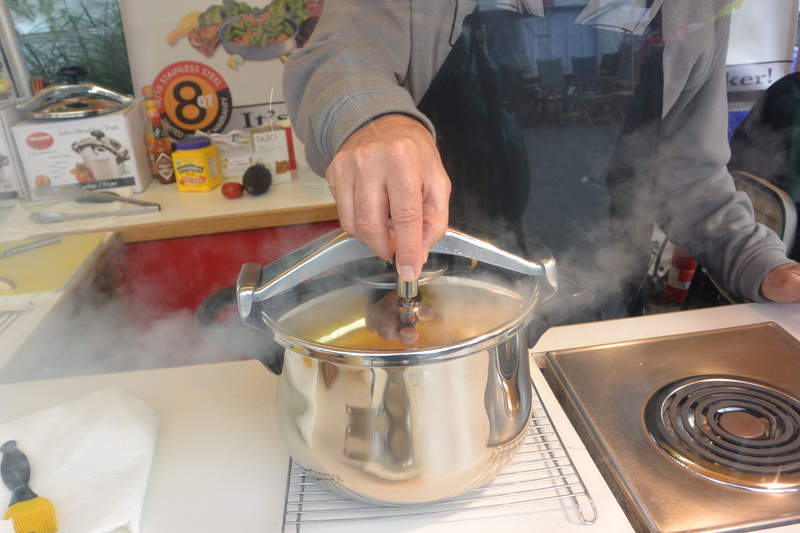 We learned a lot about how healthy and fuel-efficient pressure cooking is. Cooking under pressure seals in the food’s nutrients, and cooking much quicker under higher heat than conventional cooking, you use far less propane and time in the galley. 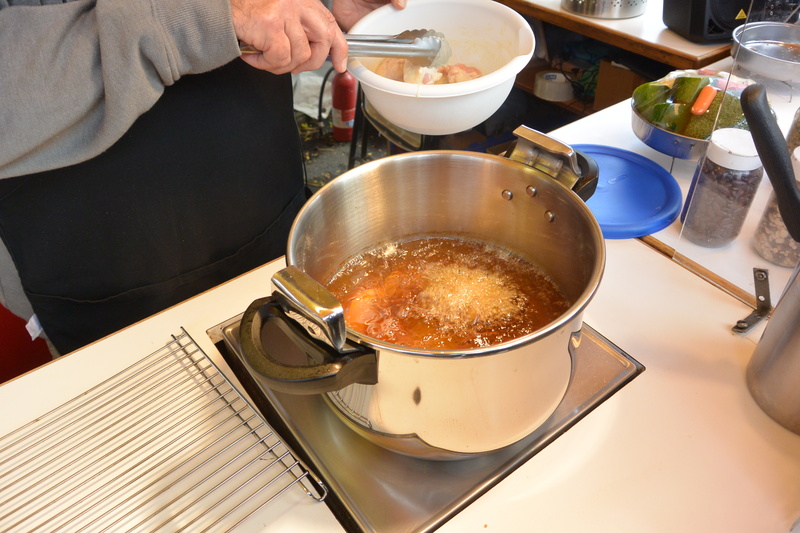 Here begins the demo of frying chicken and potatoes. In 5 minutes. They dip both the chicken and potatoes into their own batter. (Which they sell, of course.) 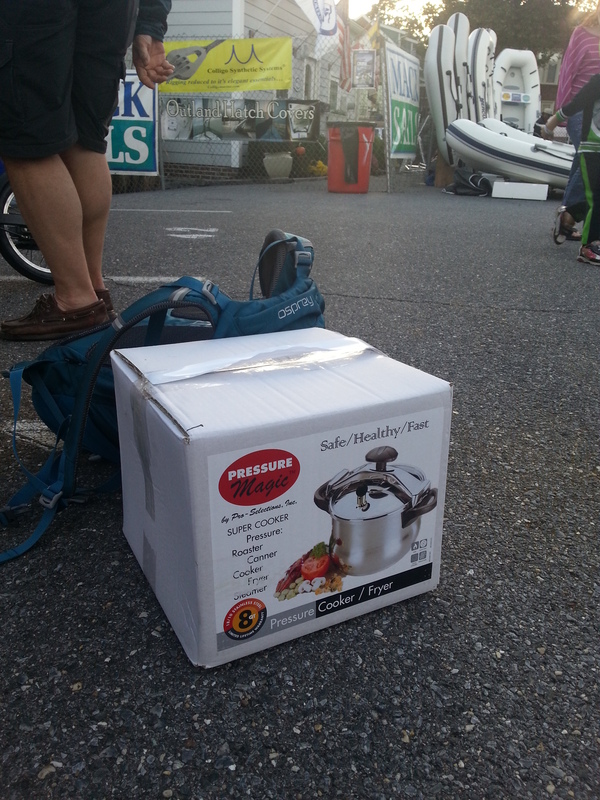 The bottom the the 8-quart pressure cooker bulges out into a nice wide base. This keeps from splattering grease in your galley. Clean up after pressure frying is surprisingly minimal. Plus they say you can reuse the oil, too. This particular brand of pressure cooler, made by Fagor from Spain, has a lid that seals down tight by turning the top handle. It also has an innovative safety release value that will automatically release if the pressure has risen too high. 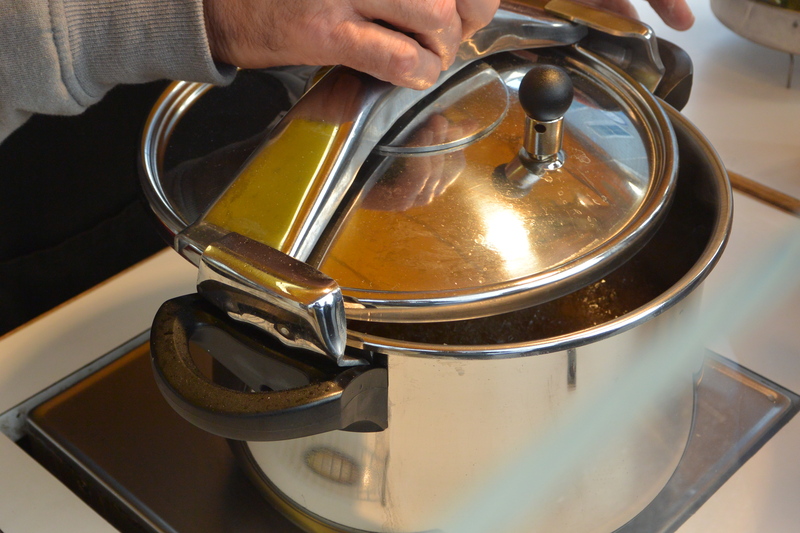 That safety valve is tucked away under the handle to prevent hot steam from contacting the cook. A demonstration of relieving pressure with the regular pressure release valve. The chicken and potatoes? Oh so yummy! Sold! 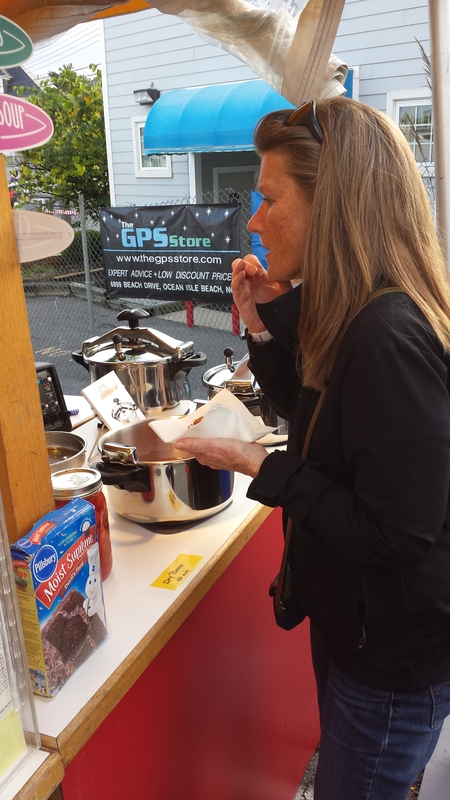 Now we’re off with our pressure cooker to the Pusser’s booth for a celebratory Pain Killer! One of many traditions at the Annapolis Sailboat Show!